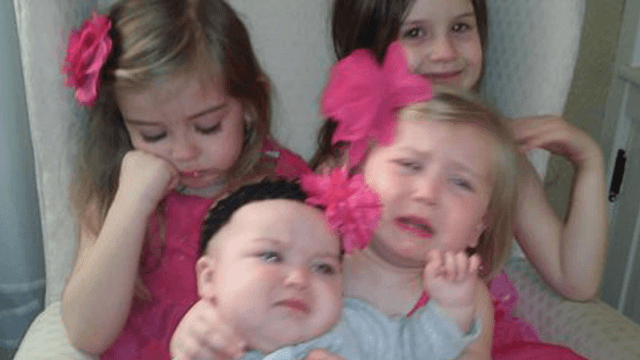 This dad's Twitter account will make you feel like you're raising his four daughters, too (Volume 2). James Breakwell is a comedy writer, a web comic designer, a professional dad to four hilarious children, and the previous subject of a Someecards article just like this one. That's because you can spend a year looking through James Breakwell's @XplodingUnicorn Twitter handle, and we decided it was time to take another disturbing dive into the comic mind of a man with arguably too many daughters. Just kidding, he's got the perfect amount. And despite his wife's objections, he just keeps the tweets flowing. 7-year-old: Why do they sell garages at garage sales? 7: So it's a garage not-for-sale? He doesn't even have the book yet. My 1-year-old refused to let go of her cup so I could put on her shirt. Today she'll be naked but well-hydrated. Wife: I have clothes for you to try on. Wife: I have some for you, too. 5-year-old: Can't. I'm a fairy. Me: Be a fairy in the tub. 5: I'M NOT A MERMAID! 5-year-old: Why are you always tired? Me: Because you're always you. 3-year-old: *points to a map on the wall* What's that? Me: It's where we live. 3: We don't live on the wall. Me: Can you use your inside voice? Me: I would do anything for you. 5-year-old: I would do anything for pizza. 7-year-old: What are we having for dinner? Me: The thing you always complain about. 7: Can you narrow it down? Today my 7-year-old got ready ahead of schedule. She's still getting dressed for her first day of school two years ago. Me: Burn it to the ground. 2-year-old: I'm strong like a tiger. Me: Use that strength to pick up your toys. Found this in my 2-year-old's bed. My 1-year-old handed me my shoes. Then she handed me a bag. I think I'm moving out. 5-year-old: Mom is the best at being smart. Me: What am I the best at? 5: Making noises when you eat. 5-year-old: I saw it in Harry Potter. 5: It's in the DVD player. Me: Is your person handsome? 5-year-old: No, they look like you. Me: Go play in separate rooms. 5-year-old: But we’re having fun. 5: My sock is too socky. Me: I'll see what I can do. Me: What do you want to do over summer break? Me: You can't do nothing for three months. 5-year-old: *looks at tacos on every plate* Ugh. Are we eating tacos? Me: No. These are for my other family. 5: *muttering* It's Friday to me. Me: Which Harry Potter movie do you want to watch? 5-year-old: The one where they use magic. My wife thought it would be cute to take a shower with our toddler and now there's poop in the tub and everyone is screaming. 5-year-old: I'm done with school! Me: For a few months. Wife: I told you to buy birthday cupcakes. Wife: These are American flag cupcakes. Me: We're still American on birthdays. If you love James Breakwell more than your own family, you can check out his book, Only Dead on the Inside: A Parent's Guide to Surviving the Zombie Apocalypse.